Did y'all see this photo on Mermaid's blog? It hit a nerve with her...and MCW...and with me, too. In the last two days I've just had a flood of memories come back to me because of this mug photo. I went to a very tiny grade school/junior high. And then went to a huge high school. At the time, it was not the feeder school from my junior high so there were only about seven of us who transitioned to this particular school. However, I had an edge up on my 8th grade peers. My best friend who lived across the street from my mother went to a different junior high school. And that school was a feeder school for our high school. Over years of friendship and birthday parties, that began in the fourth grade, I got to know many of the girls from that other school. I had a really nice friend base my freshmen year of high school, without having to try very hard. It was fantastic! I loved life! I mean, I was never popular by any stretch. But I had friends to sit with at lunch and do things with on the weekends, and that was all I ever really cared about. But shortly after our sophomore year of high school started, my best friend moved back to Canada with her family. What's funny is I have zero memory of saying goodbye or any sort of emotion around her leaving. I'm sure I was sad but I just don't remember any of the details. I do, however, vividly remember is what happened after she left. Every day at lunch, groups tended to sit in the same areas. And my group was no different. You saved seats and it never really changed much from day to day. But when best friend, Canada, moved, it all changed. Suddenly when I would go into the lunch room, I wouldn't have a seat saved for me. For over a year, one had always been there for both best friend Canada and me. And now...nothing. I started carrying all of my books and my lunch with me so that I didn't have to waste time going back to my locker before lunch to ensure I would have a seat. But when I would get there in time to get a (what I later realized was someone else's) seat, no one would talk to me. I could be in the middle of two girls talking and it was like I was invisible. I could jump in the conversation and I got dirty looks and short answers. In the halls when we passed each other when we would normally say hello and wave and smile, I got ignored. And the friend dates on the weekends and to football games ceased to exist. I suddenly had not a single friend to sit with at lunch. Not. One. I took to going into the library during lunch, where you couldn't eat. But at least I could sit down and not get stared at for being by myself. It was wretched. I cried a lot that year. But looking back, I think this next part of the story is actually the saddest. If you had asked me at that time, when I was sitting in that library all alone, starving and possessing a lunch but not able to eat it, if those were mean girls, I would have said no. I didn't think they were mean; I thought I just wasn't good enough. I internalized the entire ordeal. I was the problem...it could never be them...only me. I was probably in my late 20's or early 30's when I realized that those girls were my mean girls. It seriously took me that long to put all of that together. I also eventually made new friends. I worked up every last ounce of nerve that my introverted self could muster and asked to sit with a friend from elementary school one day. It had been years since we had been friends at that point, but I sat with her. And from there, I made new friends. It wasn't easy and it wasn't instant, but I eventually got to a better place. I made a few sweet and real friends who loved me for me. Or as Florida called us, the Dooney Club (cross-body Dooney & Bourke purses were all the rage in the mid-90's and we all wore one daily). I've actually had a few more of these stories as an adult though. So it most certainly doesn't end in high school. But I think age gives you a really powerful tool: perspective. Because the most recent time it happened, about five years ago, I both brushed it off and didn't let it go. By that I mean, that I immediately looked for new friends. Which of course didn't come instantly but I set about it much faster instead of repeating a semester of sitting alone in the library, so to speak. And I didn't let it go because I talk about that experience frequently. I am not bitter, but I think that when we don't talk about these things openly, it breeds an environment to allow the situations to repeat over and over again. I acknowledge that it happened in a way that I hope helps my group to not go down that path again. So back to the mug. I can't believe any educated woman would have the nerve to brag about such a foul attitude on social media. I also can't believe a company that is named after and run by a female would create and market such a painfully defining moment in so many lives. What a sad thing to boast on a website that is otherwise full of so many cute and colorful images! Were you ever excluded from the lunch table as a kid? Or perhaps as an adult? How long did it take you to realize that mean girls will be mean girls, regardless of what you wear, drive and say? I am with you - I can't believe she would be selling that mug! I work in a department of 17 women and some days, it's like we're in junior high again. There are cliques and whispering and rudeness going on that is appalling! I can't believe grown women act like this! Only 3 are younger than me and they are not the ones creating the drama! I remember the mean girls from junior high and high school, but it's so sad that some people continue like that into adulthood. Amazing post. As I wrote I've been victim to mean girls (6th grade was awful!,) but I've also been one. Thank goodness when I realized my behavior was hurtful I was able to change and be kind. ABD recently posted a bible quote that talks about encouraging one another and building them up. Seems to go against that stupid mug. I get it's a quote from a movie, but it doesn't matter. The theme of the movie isn't printed on the mug as well. I don't recall whose IG feed I saw this mug on, but it instantly put a bad taste in my mouth! I LOVE almost all of the other ABD products, and I'm sure this was just meant to be all in good fun, quoting a (now) cult classic movie... But it still seems in bad taste. And, quite frankly, if I saw someone drinking out of this mug, I probably wouldn't want to sit with them anyway. I completely agree with you on the mug. I do believe though that the movie is one for all teens to watch. It actually does the opposite of what this mug is trying to say. I think in the end of that movie it teaches the valuable lesson that bullying is wrong. In the end it shows the lunch tables with all different types of people sitting together. 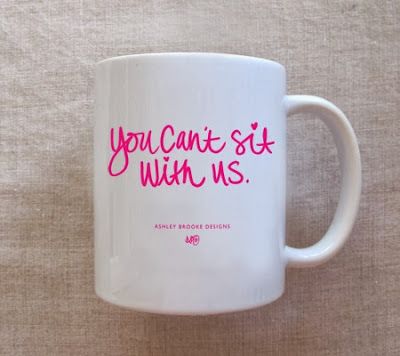 I think it would be cool if the mug said you can sit with us to show the lesson and the real moral of the movie. Thank you for putting yourself out there and sharing your story. It is empowering. I agree with you-what a sad marketing idea. I agree with your thoughts 100%. What a sad marketing concept. I'm with Sarah and MCW, I get that it's quote from a movie and possibly meant to be in jest. In reality, it's in poor taste to make such a product and seems even more so when it's from a female owned company, and one that posts bible quotes at that. I can't believe that there would be that many people who would even want that mug. To me it's not just mean, it's stupid. Not every line from a movie belongs on a mug! Many of us can relate to your post. I am a sixty-six year old grandma and unfortunately that sort of behaviour still exists. I have found many churches are very cliquish (I know, the very last place that sort of thing should exist). Fortunately at my age, I can walk away without any ill feelings. The mug is ridiculous. I'm with you. Sometimes it's just shocking how removed from reality some people can be. I was lucky enough to always have a small group of friends but even some of them were really "mean" girls and we eventually parted company - something I don't regret at all. I can relate 100%. I was a victim of mean girls in 4th and 5th grade (that early!). I think this is terrible - this "message" on a mug. This is such a great post. Thanks for sharing, I really enjoyed reading it. sooo true! can really relate to this post!